Endangered Bats - Is It Too Late? It's pretty scary to think that some endangered bats have seen their population size decrease by 50% or more within just 10years :-/ This is what has happened to the long-nosed Mexican bat (Leptonycteris nivalis). The long nosed Mexican bat is found in Mexico, Guatemala and parts of the United States such as Texas and Arizona. They feed on the nectar and pollen of different types of Agave plants and also play an important role in pollinating them. People harvest these plants for their nectar that can be used to make a number of things such as a sweeter-than-honey syrup and the alcoholic drink, tequila. This coupled with the conversion of land for agricultural use means a loss of food sources for this bat. This is a common threat that leads to bats becoming endangered, as are loss of roosting areas and roost disturbance. The International Union for Conservation of Nature (IUCN) publishes and regularly updates a list of thousands of plants and animals called the red list. The term endangered is one of the levels of classification used to indicate a species' conservation status. The Golden-Capped Fruit bat (Acerodon jubatus), is only found in the Philippines and is also endangered. One of its claims to fame are that at a weight of 1.2 kg (2.6 lb) when fully grown, it is the heaviest bat known to humankind. Deforestation has led to this species losing not only food sources but roosting sites too. And over the last 30 years, its population has more than halved. Another threat to this bat is hunting. Like the long-nosed Mexican bat, this species is an important pollinator and contributes to the regeneration of the rain forests in the Philippines. 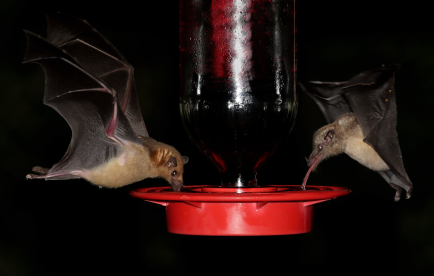 Efforts are being made to conserve both of these endangered bats. There are programs of Agave planting to try and replenish the long-nosed Mexican bats'food sources. And research is being carried out to find out where more of their roosts are so that they can be protected. The Golden-Capped fruit bat actually has legal protection in the Philippines and the hope is that this will be enforced more and more in the future.